Good news, privacy enthusiasts: Facebook’s one-on-one encrypted messaging feature called Secret Conversations is now live for all Android and iOS users. 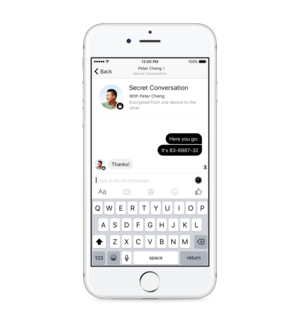 Secret Conversations allows Messenger users to send end-to-end encrypted messages to their Facebook friends. There are a few caveats, however. First, it only works on a single device. Facebook says it doesn’t have the infrastructure in place to distribute encryption keys across your phone, tablet, and PCs. A beta version of Secret Conversations on iOS. You also have to explicitly start a Secret Conversation in Messenger. Encryption isn’t the default mode, and encrypted messages are not integrated into the primary thread of your conversations with a given contact. In other words, if Alice and Bob have been chatting for years on Messenger, they’ll have to start a separate encrypted thread, and that encrypted thread will never integrate with their original, unencrypted thread. That approach is very unlike what Facebook-owned WhatsApp is doing. The popular messaging platform automatically encrypts messages for all users if they have an encryption-compatible version of WhatsApp on their phone. The final caveat for Facebook Messenger is that encrypted messaging only works in one-to-one messaging. Group conversations are not included in Secret Conversations. Now that we’ve got the preamble out of the way, here’s how to use Secret Conversations. For our example, we’re using Messenger for Android but Messenger on iOS works similarly. From the Messenger landing page, tap on your profile section, which is the person icon on the upper right of the screen. Scroll down until you see Secret Conversations and tap it. On the next screen, make sure the Secret Conversations slider is activated. Once it is, Secret Conversations are enabled for your device. 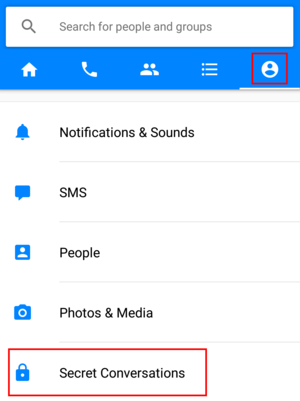 There are two ways to start an encrypted conversation in Messenger. The first is to create a new message as you usually do. Right at the top of the message creation screen you’ll see a lock icon next to a slider button. Click that and the screen theme changes color from blue to black. Now, choose the contact you want to start an encrypted conversation with, and you’re on your way. After you send an encrypted message the person receiving it will have to agree to use the Secret Conversations feature. Once they do, they’ll see your message. The second way is to initiate an encrypted conversation from a pre-existing message thread. Tap the i icon in the top right-hand corner of the message thread, and on the next screen tap Secret Conversation. The screen will turn to a black theme again, and you’re good to go. To view an open secret conversation thread just choose it from the list of open message threads on the main screen of the app. Secret Conversations work almost like regular Facebook messages but not quite. You can send text, emoji, stickers, and pictures; however, gifs, videos, voice calling, and payments are not supported. Secret Conversations has a self-destruct setting. Secret Conversations also offers a Snapchat-style self-destruct setting that you can adjust on a per-conversation basis. Open a secret conversation and then tap the stopwatch icon on the far right of the text entry area. 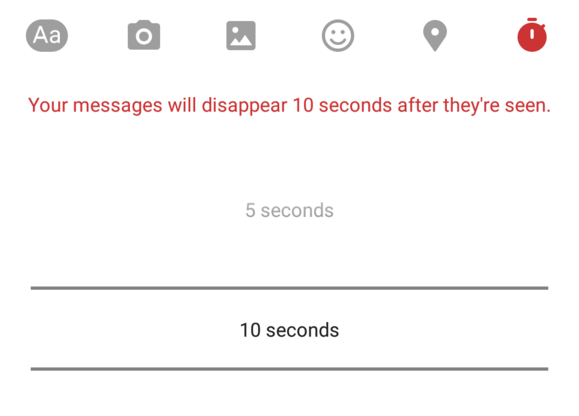 This lets you set how long your messages remain visible on the other person’s device once they’re read. You can let them to last from 5 seconds to one day, or turn off the self-destruct setting altogether. That’s about all there is to the new Secret Conversations feature. You can use it as the standard way you talk to people on Messenger—though that’s a conscious choice you’ll have to make every time you start a new message thread—or just use it for sensitive topics.